Each summer there are a wide variety of camps and clinics offered in and around the Richmond area. Your coaches are often a good source of information on upcoming camps and clinics. Many organizations will also offer summer and winter camps and clinics that help players build and hone their lacrosse skills. Below are some of the camps from the summer of 2018. The University of Richmond Lacrosse Camp offers a great opportunity for players of the game to learn and establish core fundamentals in the sport of lacrosse! All boys in attendance will receive hands-on instruction from current Richmond coaches and players. Boys ages 7-17; grades 1-12. Registration begins at 8:00 a.m. at the Intramural Fields. On subsequent days, drop off will be between 8:30-9am. Commuter campers should be picked up at 3pm. Meals at the Heilman Dining Center and lodging are included for those that select this option. For a campus map and directions, click HERE. 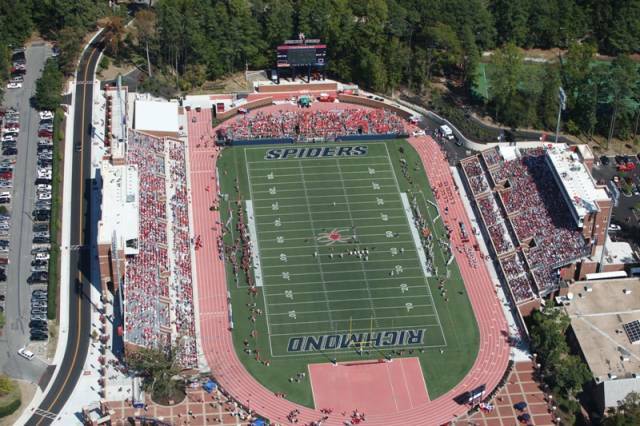 Camp will take place at Robins Stadium/Intramural Fields. Cost is $525 for overnight Camper; $350 for commuter camper. There is a UR faculty/staff discount of 10% available. Only parents/guardians may apply for this discount (indirect relatives not included). A team discount is also available (10%). If 8 or more people from your team do not register by the event date, YOU will be responsible for paying the difference at the time of check-in. Only one (1) discount may be applied. Refund/Cancellation: Each registration includes a non-refundable $100 deposit and a nonrefundable $6.50 processing fee. Any cancellations within one week of camp will not receive a refund. 2018 senior players are also welcome at the Elite Camp as we can help prepare your skills for college. Opportunity for college-bound young men to get an early look at Hampden-Sydney College. The sessions are designed to meet the needs of middle and elementary school athletes and those moving on to high school programs in field hockey and/or lacrosse. Campers will enhance individual skills and learn team tactics and the rules of the game for each sport. Staff includes top coaches and players from the Richmond area. Coaches from the US Field Hockey Futures Program and members of the local US Lacrosse chapter, college players, and former and current Trinity players will be on hand to maximize each camper’s experience. camps at Collegiate contact: (804) 741-9714.
camps at Collegiate contact: (804) 741-9703.
camps at Collegiate contact: (804) 741-6257. Trojan40 Lacrosse is the Midlothian High School Boy's lacrosse community development program dedicated to continuing the tradition of excellence and community character building for the boys playing and wishing to play High school lacrosse for Midlothian HIgh School. Rising 5th thru 10th graders. Placement for beginners to advanced players. Current College and Varsity High school players & coaches on staff. Lax Pinny, tee shirt, and promotional giveaways. Goalie Clinic for boys and girls goalies in Richmond area.